As busy Executives and Office Managers, you know that efficient filing systems are critical to your business. The ability to quickly and easily locate records and documents in your file cabinet or pedestal desk drawer is part of what determines how successful you and your business will be. 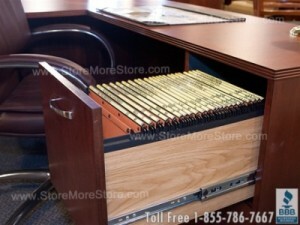 What could be better than a top of the line filing system designed for executives? The answer to that question is environmentally friendly filing folders that cost less than the standard filing folders. The best solution to solve all your concerns is Oblique Executive Top Tab Hanging File Folders because they are efficient, durable, and environmentally friendly. Why Use Oblique Executive Top Tab Hanging File Folders? Oblique Executive Top Tab Hanging File Folders are the best choice for your business because they stand apart from all other Pendaflex®-type products. 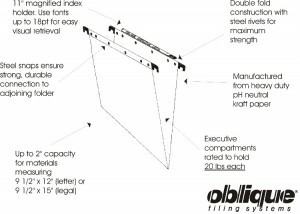 Oblique Executive Top Tab Hanging File Folders are the most durable file folder on the market today because they are made of 220 gram ph neutral tear proof Kraft manila, designed to hold 20 to 25 pounds in weight, which guarantees they will outlast any other file drawer folder on the market. Guaranteed? Yes, guaranteed with an unparalleled 10 Year Warranty. Furthermore, the Oblique hanging folders have the easiest to read full length 11 inch magnified file label in the industry. The magnified file labels make finding your desired folder quick and easy from a distance and allow users 11” to index file folder name labels to the greatest detail. Another great feature is that the labels come in six colors to organize and categorize your files for quick retrieval. Finally, documents will never slip between hanging file folders or to the bottom of the file drawer because Oblique Executive Top Tab Hanging File Folders snap together to give you confidence and accuracy when filing important documents. The file folder hanging suspension bars are riveted to the folder’s manila material with steel rivets creating a tear proof bond and snaps/links folders together to prevent documents from accidentally being placed between file folders. Oblique Executive Top Tab Hanging File Folders have an added bonus of being eco-friendly. Oblique’s ECO- STOR Executive® Letter and Legal Size Drawer Folders are the industry’s first and only fully biodegradable hanging file system. They are 100% natural chlorine and emission free as well as ph neutral and acid free, the label holder is made from polymer extracted sugar, and the metal parts are exempt of heavy metal. They will leave no carbon footprint after only 2 years in a landfill. • Full length, 11″ magnified label allows users to index files using the greatest detail. • Folders snap together to ensure documents stay in the files, not between the files. • Six colors of index labels to help categorize and organize your documents (Blue, Brown, Green, Red, White, and Yellow). • Fit in your vertical and lateral filing cabinets, pedestal and desk drawers. 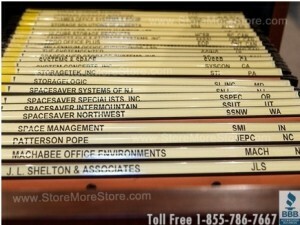 Upgrade your filing system today to Oblique Executive Top Tab Hanging File Folders from StoreMoreStore.com!